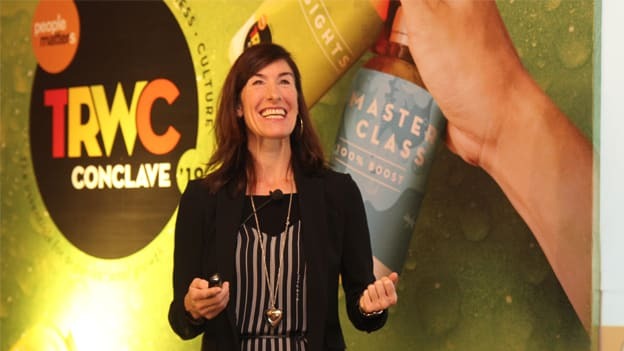 In a session titled “Workplace Wellness that Works: Lessons Learned” at TRWC 2019, Laura Putnam, CEO, Motion Infusion, shared lessons on how to make a workplace wellness strategy work. “What is you at your best?” asked Laura Putnam, CEO, Motion Infusion & Author - Workplace Wellness, to an august gathering of HR leaders, kickstarting her insightful session on the lessons learned on workplace wellness that works. The question could not have been more apt a start to a session in which Laura shared research findings and examples on the science behind motivation, importance of addressing the larger culture and environment, and the criticality of engaging leaders, especially managers, for a successful wellness strategy or in other words, helping employees to be at their best. Why is it that at work, we often find that we are doing anything but becoming our better selves? Overworked, overstressed, and overweight- we hardly find ourselves at our best. No wonder, we are seeing a tidal wave of heart disease, diabetes, stress and depression-driven largely by our lifestyle. This is going to affect our children and future generations as well. So what can an individual do to arrest this tidal wave? What can organizations do to bring workplace wellness that works? Laura advises a three-pronged approach to put in place a workplace wellness strategy that does not suffer from the current crisis of engagement. In the world of workplace wellness, we have wrongly associated incentives with motivation. Organization think that if we they incentivize employees, they will be motivated to opt in for wellness programs. They think the method of extrinsic motivation-pay them or penalize them-can goad employees into trying to get them to engage with wellness. But research shows that while incentives may get people in the door, they will never keep them in. And we want people to make changes that last not just today but for a lifetime. The truth of the matter is that we simply can’t get someone motivated-they motivate themselves. The best organizations can do for sustainable motivation is to create an environment where people can motivate themselves day in and day out. This leads us to Motivation 3.0 and this is to create meaning or what researchers called intrinsic motivation-motivation that comes from within. Intrinsic motivation taps into an individual’s need for mastery-how can I get good at this? It also taps into his need for association and relatedness -i.e. who can he work out with? Lastly, it taps into an individual’s why-and that’s what sustains him. Applying the same to the workplace, wellness initiatives could be shaped similarly where say for instance, employees go mountain climbing together or say dancing together. Engaging senior leaders to lead the program, works in wellness too. Their participation matters in setting the tone and locating resources. But perhaps more important is the participation of managers. Research suggests that it is managers who effectively give permission to their teams to engage with well-being. The manager alone accounts for about 70% of the variance of the extent to which his team is likely to engage with well-being. So a manager’s participation creates a ripple effect. So if you are one of those managers who send out late night emails, for every hour that you engage in afterhours email time, it translates into an additional 20 mins of afterhours email time for your employees. This directly cuts into the ideas of wellness. So every manager has a choice to make-is he going to stick his head in the sand and pretend that wellness doesn’t work or instead become a multiplier of well-being? Hence they need to lead by example in order to enable his team to become high performers, lead the conversation around wellbeing, and set up systems and processes to normalize wellbeing in their teams. As human beings, we are more creatures of culture than creatures of habit. Today are environments are such that they promote obesity instead of wellness. So for an individual to make changes in their lifestyle, optimizing the environment and culture for them to do so is imperative for sustaining wellness programs. Organizations need to design nudges and cues to help employees in their wellness journeys. For instance, a simple sign board which says walk away from the elevator, take the stairs is a simple nudge to push employees to a better alternative. Or even something like, your chair needs a break, so do you! Similarly by putting out healthier options in front of employees be it in terms of food-using color coded plates to cue people in to the healthy option or in terms or transportation ( by providing bikes), or holding walking meetings, can optimize the environment and culture for wellness and start a wellness movement in the organization.